Candidates must be U.S. citizens. Distinguished himself/herself through public service activities in science and technology. Pioneered the exploration, charting, and settlement of new frontiers in science, technology, education, and public service. Demonstrated leadership and creativity that have inspired others to distinguished careers in science and technology. Contributed to the welfare of the Nation and mankind through activities in science and technology. Demonstrated leadership and creativity that has helped mold the history of advancements in the Nation’s science, technology, and education. 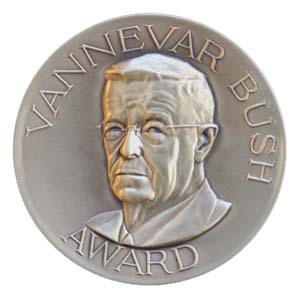 The award honors the memory of Vannevar Bush, who served as science advisor to President Franklin Roosevelt during World War II, helped to establish Federal funding for science and engineering as a national priority during peacetime and was behind the creation of the National Science Foundation. Past recipients include Bruce Alberts, Harold Varmus, and Maxine Singer. The deadline for nominations is October 1, 2015.